23 year old Hull born blue liner Tommy Ralph is back with the Invicta Dynamos for 2017/18 after penning a deal that will keep the NIHL South Division 1 playoff champion in Gillingham for a second consecutive campaign. Tommy Ralph’s debut term with the Dynamos in 2016/17 was his first down south after the blue liner had previously risen through the junior ranks in Kingston before going on to appear for Hull in the NIHL North Division 2, the Whitley Warriors in the NIHL North’s top tier, the Hull Stingrays and Coventry Blaze in the Elite League and Hull Pirates in the EPL. Seeking a change, he was then tempted to Kent last season having dressed for 85 games in the top tier of British hockey and a further 48 times in the division below. Now at the SilverBlades, Tommy Ralph settled quickly for the Mos and he would feature in all but four of the team’s 46 fixtures across the league, cup and playoff competitions. In those 42 appearances the club’s number 14 managed 2 goals from back on the blue line whilst also chipping in with 16 assists for a total of 18 points and tallying 91 minutes of penalties. 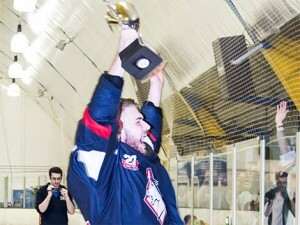 Partnering with import Ondrej Zosiak, Ralph was one half of arguably the NIHL South Division 1’s strongest defensive pairing and his work at the back helped ensure the team secured a 19th honour in their 20th campaign by lifting the NIHL Southern Playoff title in April. Having firmly found his feet in Kent the experienced defenceman will now return for a second season at the SilverBlades where he becomes the sixth player on the roster following the re-signings of Damien King, Ondrej Zosiak, Mason Webster and John Dibble and the capture of new face Bobby Chamberlain. 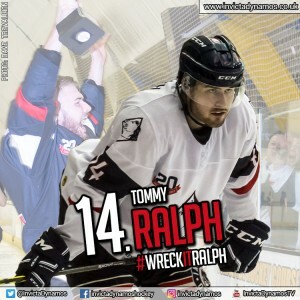 Blue liner Tommy Ralph will once again wear the number 14 jersey in Gillingham when the new season gets underway in September. To stay up to date with news of his teammates for the upcoming campaign as they are announced stay tuned to the club’s website, Facebook page, Twitter feed or Instagram account. Warm-up Jersey – For just £125 get your name or logo printed on the back of Tommy Ralph’s warm-up jersey. Sponsors are also named on our website and in our match day programme and then presented with the jersey to keep at the end of the season. Game jerseys – For just £250 for individuals / £300 for businesses get your name or logo on the back of Tommy Ralph’s game jerseys. Sponsors are also named on our website and in our match day programme, are announced over the loudspeaker during player introductions at every home game, receive a programme advert (business sponsors only) and are presented with the jersey of their choice at the end of the season.